If your body is craving something healthy and tasty, but there is no room for cooking in your overcrowded schedule, it is time to give meal delivery services a shot. Check out our Dinnerly VS Plated comparison and find out which one to trust with taking care of your diet. Enjoy amazing meals, hassle-free! Dinnerly allows you to save both time and cash and enjoy delicious homecooked meals without spending more than 30 minutes in the kitchen. Dinnerly offers one menu that changes on a weekly basis. Dinnerly provides 8 meal options on its menu every week. Dinnerly offers kid-friendly, vegan-friendly, vegetarian-friendly, low-carb, low-calorie, gluten-free, and dairy-free dinner recipes. You can also opt for one-pot and under-30-minutes recipes. However, keep in mind that not all of these options are available at all times. The meals are mostly classics and crowdpleasers. Dinnerly sources only the best, freshest ingredients. It provides natural fruit and veg, grass-fed beef, antibiotic-free chicken, American-caught shrimp, and many other healthy, high-quality products. The meals you make with Dinnerly normally have between 600 and 800 calories per serving, although some hearty meals may have 900+ calories per serving. The portions are large enough to keep you satiated for hours and they contain the right proportions of carbs, proteins, and fats. Dinnerly offers plenth of flexibility to its patrons, allowing you to change, skip, pause or cancel your order whenever you wish. Any changes to your subscription must be made 5 or 6 days before your next delivery, depending on your location. As Dinnerly features a freshness and quality guarantee, you can contact the company within 7 days of your delivery date for a refund or credit. We've been using Dinnerly for a while now. Prior to that we tried Blue Apron and Hello Fresh. We appreciate that Dinnerly is better for our budget than Blue Apron and Hello Fresh. All of them once in a while have a smashed product but that's the nature of shipping. It's rare. Yes we have to print the recipes...that's not a big deal. Overall have been very happy with the Dinnerly service and price. The meals are not too hard to make and tasty. I have tried two other delivery meal plans. They were ok but twice the price. Maybe more selections but Dinnerly is just find for my needs. I commute three times a week. When I get home the last thing I want to think about is what to cook for dinner. Dinnerly so far has been good and it hits my price point. I'm staying! I love Dinnerly! There are so many meal options; it's often hard for me to choose just three. But now they offer the option to pick more meals if you want, up to 6 per week, so it's great! On the off chance I don't like 3 meals in a certain week, or if I don't feel like cooking, I can also easily skip a week, on their user-friendly website. I also like how the website allows subscribers to plan out meal orders for multiple weeks in advance. For singles or couples, getting just enough of each ingredient needed to make the meals is super-convenient and prevents waste. I also love how simple yet flavorful the meals are, using pork, chicken, or grass-fed beef in Asian, Mexican, Italian, and American meals. I personally hate seafood, mushrooms, lamb, and veal, so I'm happy those items are never included! The only criticism I have is that they send too much garlic. Every time a recipe calls for one clove, I get an entire head, so there's a ton leftover! Just received my first (and last) box. No recipe cards, meat, cheese and peas smashed into a little bag with an ice pack, and other ingredients rattling around loosely in the box. Two gigantic russet potatoes and a heavy bag of ice and meat do not play well with hamburger buns. There's an unidentified bottle of brown liquid I THINK is Teriyaki sauce. I tried to log in to my account and suddenly it's not accepting my email. I have tried to reset my password 12 times and never received a link in my email. I used Blue Apron for years before switching to Hello Fresh for several years. It was excellent with great customer service. Dinnerly is not responding to my emails, my social media posts, or anything else. I will be canceling my account the minute I hear from somebody. It's worth paying more for high-quality products packed so they aren't damaged, and recipe cards in the box. Dinnerly gets one star only because it's required. This one's a zero. Plated is a meal kit delivery service that offers very flexible subscription plans, as well as high-quality foods. Each week, it comes up with a new seasonal menu, including 20 new recipes and 2 desserts, easily meeting the needs of its customers. 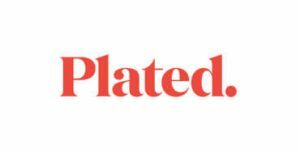 Read our thorough analysis of the Plated meal kit service and dozens of user-written Plated reviews.